After swapping sizes several times, recovering from a persistent stress fracture, and waiting for a burly Utah winter to abate, I have finally had a chance to test out the Brooks Cascadia 13. Cascadias have long been an extremely popular choice among long-distance hikers and trail runners alike. With several notable upgrades to an already well-loved shoe, not to mention a few ounces shaved, the Cascadia 13 is sure to be popular as ever this season. Here’s the run down. Notice the gaiter trap open on the heel. BioMoGo DNA Midsole: This is the standard cushioning for Brooks. BioMoGo DNA is an adaptive cushioning technology designed to respond to a person’s individual differences by adapting to whatever force it’s applied to. This won’t compensate for an incorrectly chosen heel-toe drop (see below), but overall BioMoGo will adjust to you and your activity, even when either variable changes (for example, when you speed up and slow down, go uphill or downhill, or lose 30 pounds during your thru-hike). Pivot Post System: The outsole is arguably the most distinct part of the Cascadia 13, with their new Pivot Post System. 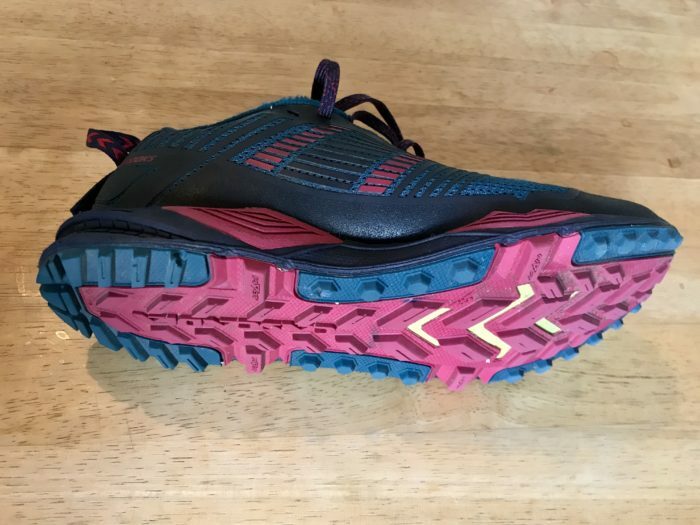 This is comprised of four lugs (the four pink spots amid the blue outer portion of the sole, pictured above), designed to offer stability across any terrain, in any condition. This is the primary source of the “SUV-like stability” Brooks boasts for the Cascadia 13, along with the yellow “V” marks in the sole. Gaiter Trap and Lace Pocket: The gaiter trap is an update from the Cascadia 12. I especially like this style because it’s long, and opens from the bottom instead of the top. For whatever reason, that seems to make a difference in how securely my Dirty Girls catch. There’s also a nice lace pocket on the tongue and it’s easy to get the laces in and out. Very compatible with Kahtoola Microspikes. 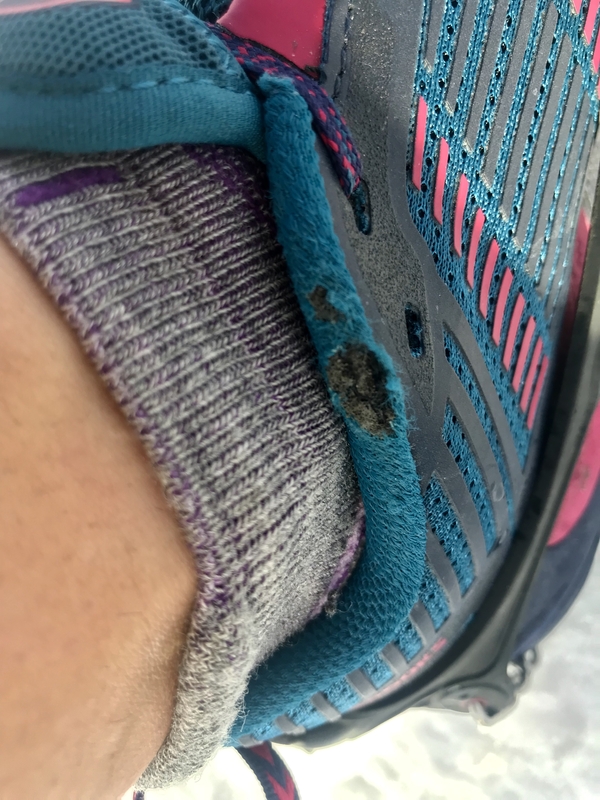 I have been road running in Brooks’ PureFlow for many, many years and I no longer need to try them on—I know I wear a size 7.5. Naturally, I ordered a size 7.5 in the Cascadias, but they were far too big. I went back and forth downsizing until I eventually settled on a size 6.5. This is actually consistent with my size in trail runners by both Altra and Salomon. 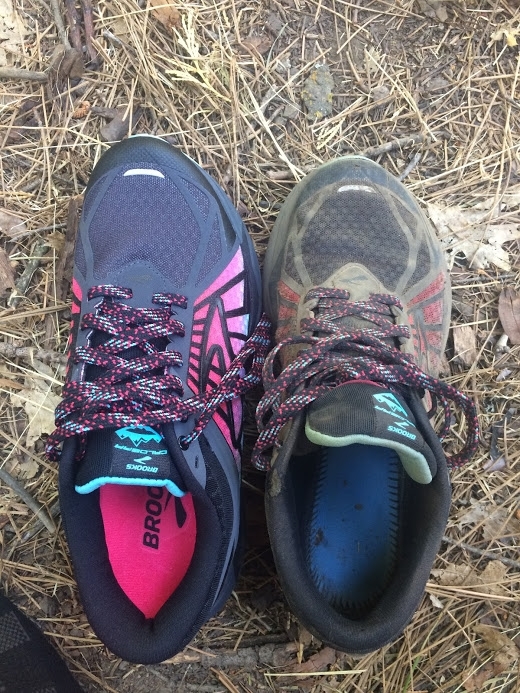 So, if you are comparing across companies, I would tell you they fit true to size; if you are comparing within Brooks (road vs. trail), I would tell you they run large. There is an extra set of well-positioned lace holes to ensure a good heel lock, but I did not need them—they laced very securely as they were. Though it doesn’t rival the openness of Altra’s FootShape toe box, the toe box on the Cascadia 13 is decently spacious. Overall, they offered terrific grip over snowy, slippery, and muddy terrains. However, there were a few times I needed my Microspikes, and I was surprised by how compatible the shoes were with the spikes’ casing. It did not feel like the spikes were pushing down too much on the upper and caving in on my feet, which would be a huge plus for someone looking to wear these shoes on a long trail with highly variable terrain requiring on-again/off-again spikes. I wore these through about 350 miles of running and hiking across steep, snowy mountains, slick rock and sand in the desert, regular dirt, and a whole lot of mud. All that underfoot, and the only part of the shoes that even remotely started to wear out (besides the cushion, which is to be expected) was the top rim of the shoe near the tongue; you can see where the fabric is wearing down. Initially, these shoes were very comfortable. They have a wide enough toe box, they are lightweight, and they offer a ton of protection from rocks/debris coming from just about every direction. The suspension generated by the pivot post outsole creates noticeable ease and stability in lateral movements—especially prominent on slickrock—and the cushion feels great. So why, then, did I start feeling so much discomfort? Last year I developed a tibial stress fracture that took its sweet time healing, and has left me with some structural instability in my left shin. I started having some considerable pain about 100 miles into these shoes, even on shorter (~5 miles) trail runs. I went back to my orthopedist for another MRI to ensure I hadn’t refractured my tibia, but the scan was clear except for some inflammation. What gives? We did a gait analysis and seem to have discovered the answer. The drop of a shoe is the difference between the height of the heel and the height of the toe. For example, a shoe with a 25 mm thick heel cushion and a 10 mm thick forefoot cushion has a 10 mm drop. High-drop shoes (ten to 12 mm) promote heel striking, because the relatively larger wedge under your heel has to hit the ground first. If you aren’t a heel striker (read: me), this is not going to feel good and it’s going to disrupt your gait, which opens the door to injury. The body is forced into a forward-leaning position with higher drop shoes, putting additional stress on the ankle, the midfoot, and the calf (and thus also the shin). Zero-drop shoes are better for midfoot and forefoot strikers, and arguably for everyone. But that’s another conversation. After stubbornly pushing through in these Cascadias, I’ve since switched back to the zero-drop Altra Timp and my legs are much, much happier. Calderas new and old, somewhere in NorCal. Nothing quite like the feeling of a new pair of shoes when all you do is walk. I hiked the PCT from Sierra City, CA, to Elk Lake Resort, OR, (~750 miles) in Brooks Calderas. It’s not an apples-to-apples comparison because my experience wasn’t with the newest version of the Caldera, but I can give you the gist. Not surprisingly, the biggest difference for me is the drop: the Caldera has a 4mm drop, which feels almost equally as good as a zero drop to me (incidentally, the Brooks PureFlow that I mentioned above is also a 4mm drop). The Caldera is also a neutral/cushion shoe, though with slightly more cushion than the Cascadia. The Caldera is a little bit lighter, but ounces never come without a cost. The Cascadia is designed with stronger outsole durability and protection, namely the pivot posts. This difference will be meaningful in a PCT versus AT type of comparison. Someone on the rocky AT might accept the cost of some additional ounces in exchange for increased protection from rocks and debris, while someone on the PCT might accept the cost of less protection in exchange for lighter weight and more cushion while pushing for higher mileage days. 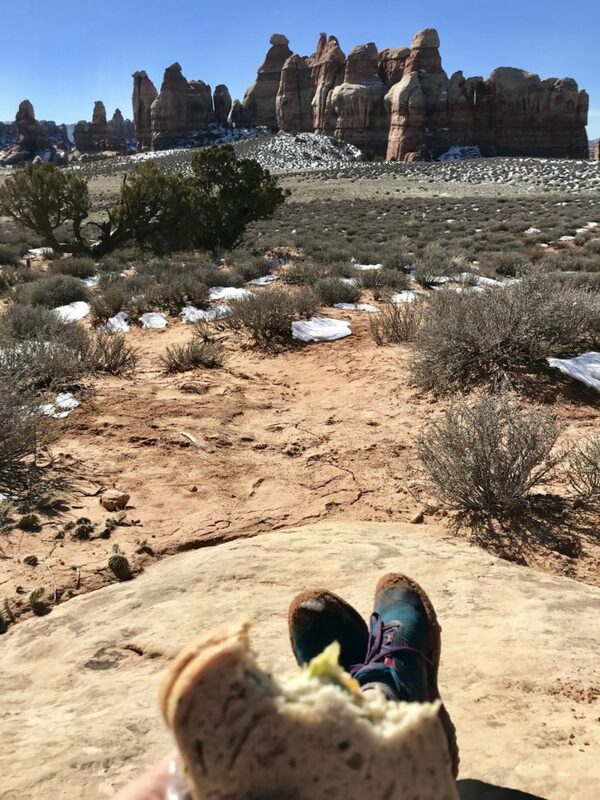 Lunch with muddy shoes and a fabulous view in Canyonlands National Park’s Needles District. Notice how the mud guard on the toe is preventing the mud from getting to my feet. 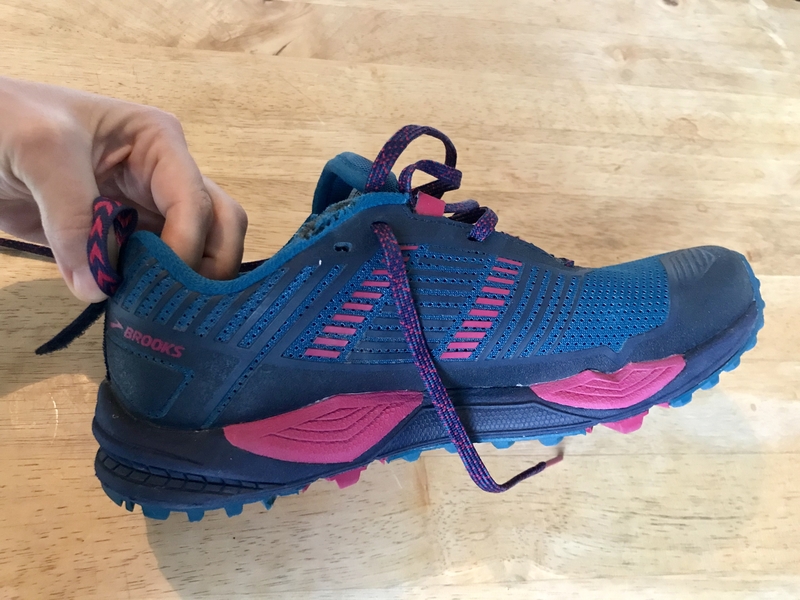 Theoretically, these shoes are awesome: great durability, excellent grip, surprising versatility, solid cushion, lightweight, and a snazzy design. While these shoes weren’t a great fit for me, that’s par for the course with trying different types of shoes. If a shoe doesn’t feel great, it can have nothing to do with the shoe. As with all things gear and trekking, listen to your body—it’s smarter than you. 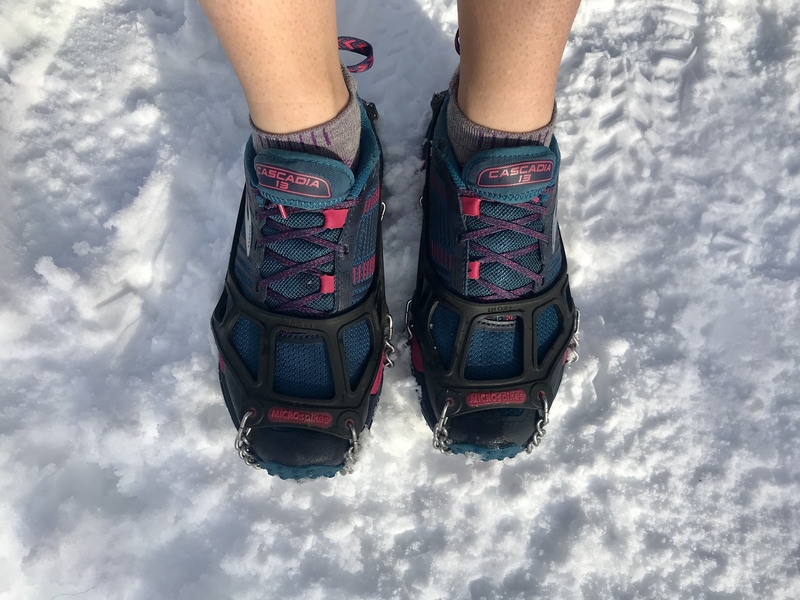 I can still confidently recommend the Cascadia 13 to trail runners, day hikers, and long-distance backpackers heading out to just about any trail, in just about any conditions. You will get good bang for your buck in terms of durability, and as long as you can handle a higher drop, I think these will serve you incredibly well.